Donna Phelan back again. Today I m sharing an elegant Golden Harp card with you all. The Tutti Designs Store has so many wonderful dies for all of your card making needs! This month it's all about Musical Instruments, check out the June Release! I used this FUN little die from Tutti Designs. Again, so much detail! 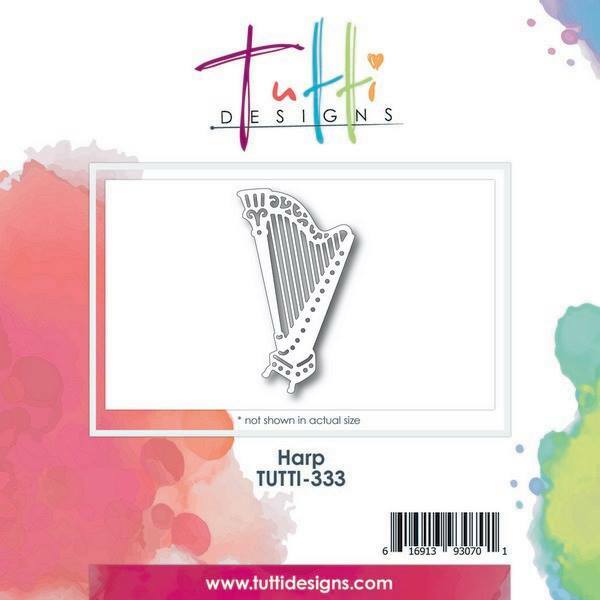 I knew immediately that this Harp had to be Gold Foiled, no ifs, ands, or buts about it! I added lots of Gold Foil accents. My Designer Paper was foiled as were the layers between. I even Heat Embossed my sentiment in Gold Powder tying it all together. Just beautiful Donna and yes! Gold foil was PERFECT! Love your design ... it too is Perfect! Well done! WOW! I just love the dotty background and beautiful, elegant color palette. Perfect layout!